September will always seem like the start of a new year – and this one has lots happening! 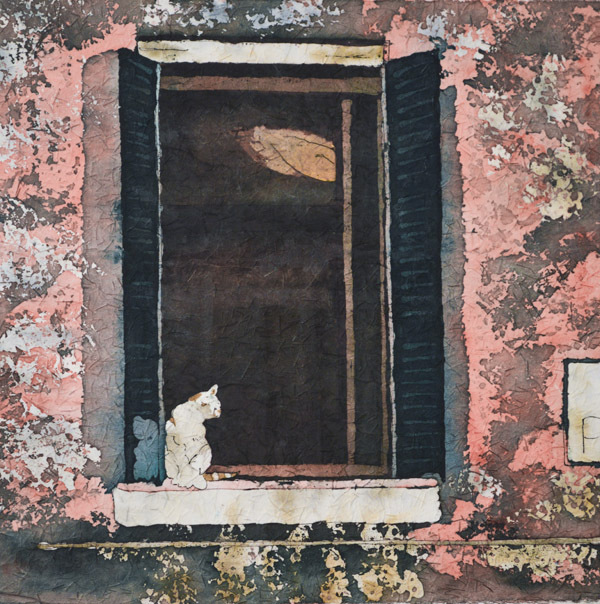 Friday, August 31 is the last day to see“Looking Back, Looking Out, Looking In” at the Humboldt Art Gallery. This was a two person show with work by Jess Richter along with my watercolour batiks. Saturday we go to dismantle it. Thanks to the Humboldt Gallery for being great to work with and to everyone who has been to see it! Art friends with beautiful back yards have provided several fabulous sketching opportunities over the summer! I have so much news to share! I have been selected for an Exciting Mentorship Program! I am honoured to have been accepted as a mentee in the CARFAC mentorship program. My mentor will be Paula Cooley and I am very excited to see what the year will bring! This 10 month mentorship program includes support from a mentor, group meetings, studio visits, critiques and will be a major creative boost! Many Saskatchewan Galleries will have booths at this amazing show. It started 3 years ago in Saskatoon, was in Regina last year and is back in Saskatoon. It keeps getting better! You will find my work in the Saskatchewan Craft Council‘s area! This is 1 of 4 bridges that they selected in the jury process. 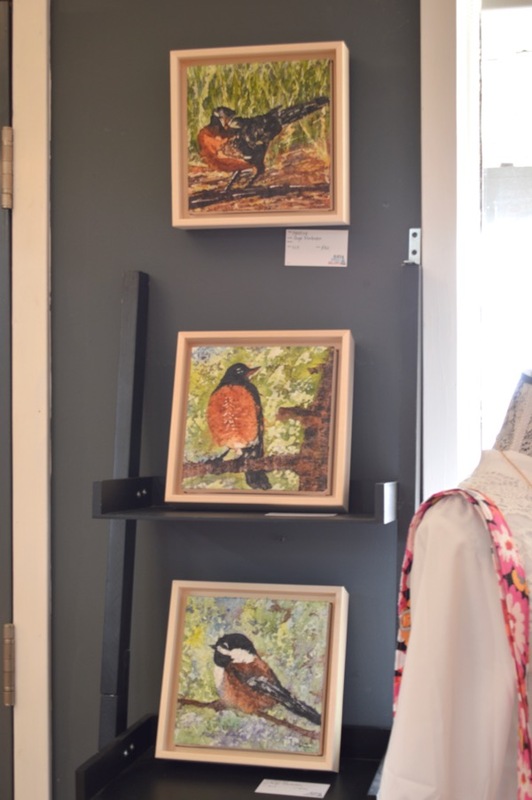 The Station Arts Centre in Rosthern has a lovely gallery and tea room and the group show “Birds of a Feather” will be up for the month of September. They are open Tuesday – Saturday 9 am – 4 pm (closed Sunday and Monday). There will be a closing reception on Saturday, September 29th from 7 – 9 pm. This is the 3rd year for this show and the 3rd time I have participated. It is a great gallery so worth the drive. 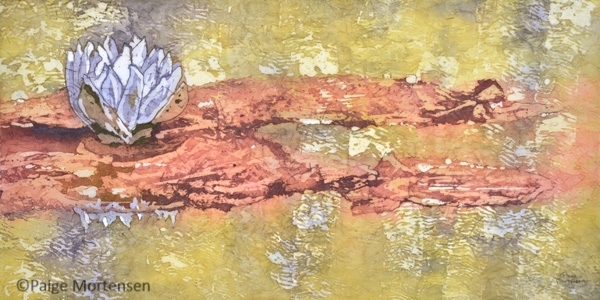 The Humboldt Art Gallery is open Tuesday – Saturday 1 – 5 pm. There will be a reception on Saturday, Sept 22 from 2 – 4 pm. 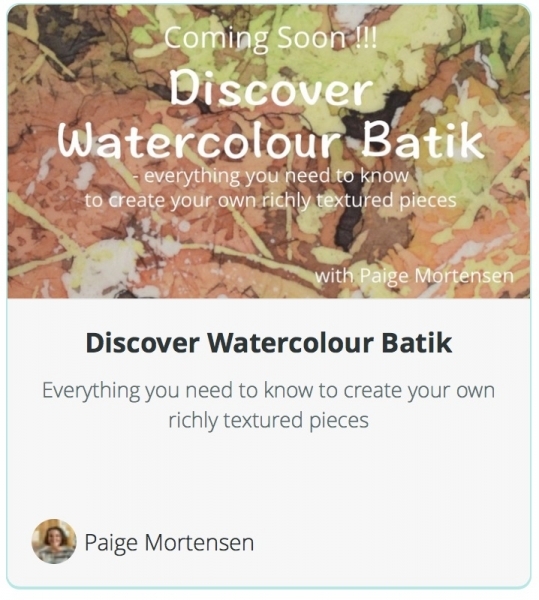 With special thanks to my video editing husband and photography pro son I am soon going to be releasing a full online watercolour batik class – Discover Watercolour Batik. 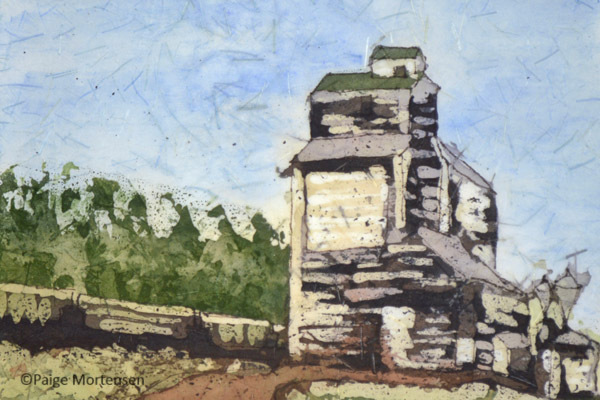 Everything you need to know to create your own beautiful watercolour batiks! Over 3 hours of video instruction that you can follow along with. I am excited to see what others create! 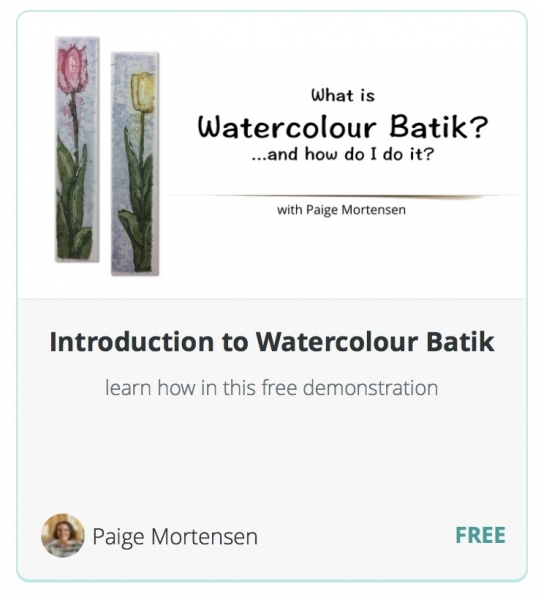 For a sneak peak you can register for this free one – Introduction to Watercolour Batik – which will give you a quick overview of my process – for collectors or curious artists! Have a great start to the fall season! 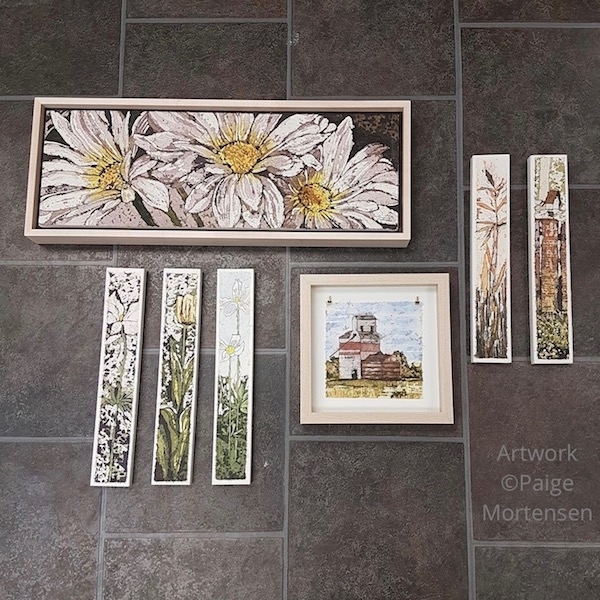 This entry was posted in Artistic Process, Being an Artist, Events, Gallery, In My Studio, Watercolour Batik and tagged Classes, Community, creative process, events, How to, Watercolour Batik on August 29, 2018 by Paige Mortensen. I am very excited that the Saskatchewn Craft Council has selected 6 of my watercolour batiks for their booth at HomeStyles 2018! 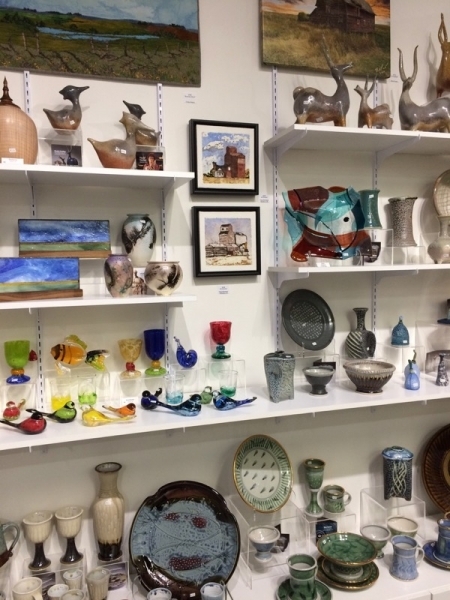 The Saskatchewan Craft Council (SCC) is returning to HomeStyles Home Show 2018 to showcase Fine Craft and Saskatchewan’s artists. Our booth will be located in Hall C across from the Main Stage. Visitors will have an opportunity to explore how Fine Craft contributes to making a home a place of self-expression. Fine Craft can be part of your daily life, enhancing everyday experiences with its beauty. Featured vignettes will include a child’s room, a foyer, and a cottage and outdoor patio. 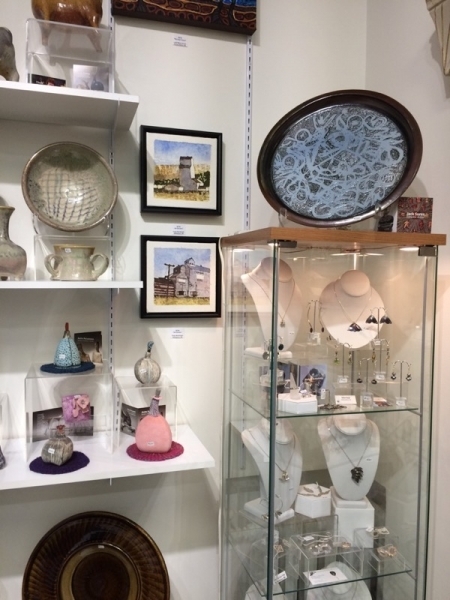 The SCC booth will feature works in wood, glass, textiles, photography, metal, visual art, and ceramics. Pieces will be available for purchase at the Saskatchewan Craft Council’s Online Gallery Shop (saskcraftcouncil.org/online-store) from March 8 to March 16 or in person at our booth during the show. This booth is supported by Creative Saskatchewan, EPR Saskatoon, and Saskatoon & Region Home Builders’ Association. SCC is excited to present a panel discussion on integrating Fine Craft into your daily living space on the Main Stage at HomeStyles Home Show 2018. Handmade Home: Collecting & Using Fine Craft will take place on Thursday, March 8 at 6 pm. Crystal Bueckert of Big.Studio.Inc, a design and architectural firm in Saskatoon, will moderate. Her guests will include home owners who incorporate art into their homes, providing tips and ideas on how to find and select the right pieces to help you develop your home’s personality. This is a member’s show and we were each able to submit two pieces. 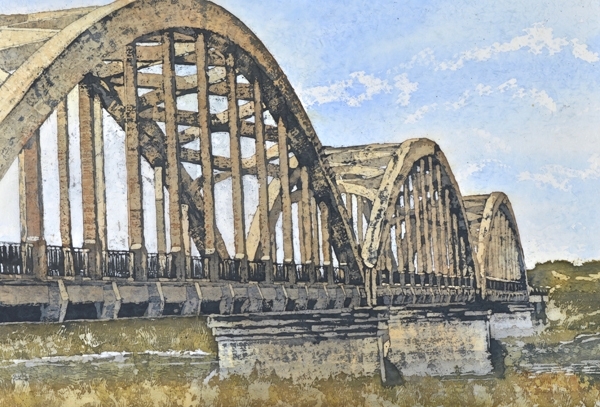 I am excited to say that this Borden Bridge piece won an award for Accomplishments in Watercolour! Show is on now until March 24, 2018. This is my first time submitting to this show and I’m excited to have the opportunity! Watch for more exciting news coming soon!! 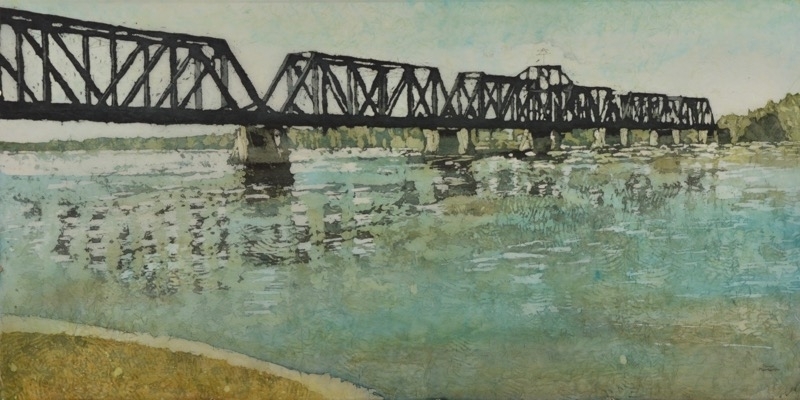 This entry was posted in Events, Gallery, Out and About, Watercolour Batik and tagged Batik, shows, water-color, Watercolour Batik on March 5, 2018 by Paige Mortensen. “And Art Gallery” opening in Davidson, and more gallery news! I have exciting gallery news to share! The first piece of exciting gallery news is that I am now represented by AND ART GALLERY in Davidson! 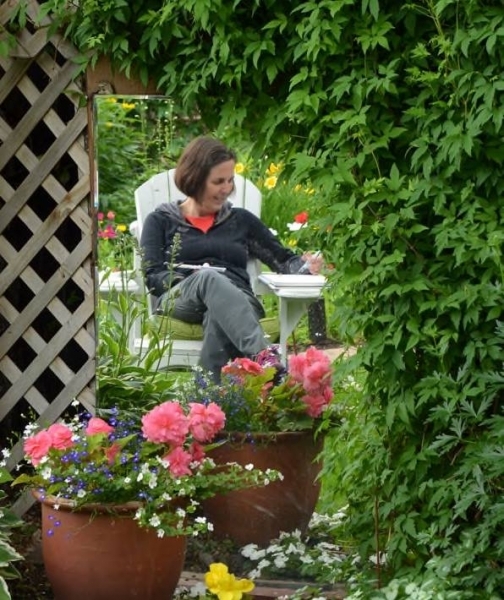 The owner, Gail Prpick, is also fellow member of the Artists’ Workshop group. 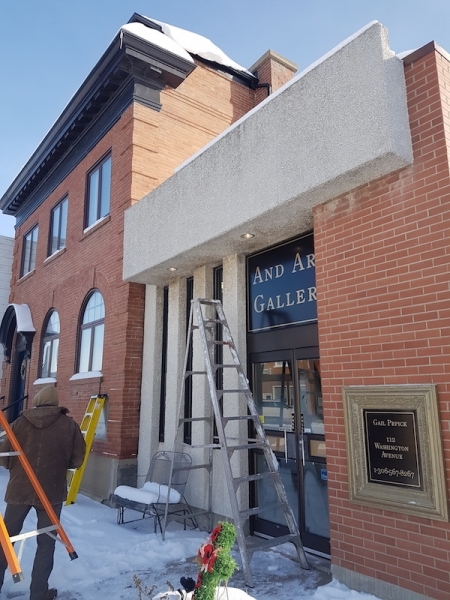 And Art Gallery, at 112 Washington Ave, Davidson,SK is housed in a century old brick building that use to be a bank. Saturday, November 18th from 11 a.m. – 4 p.m.
I’ll be there Friday evening to celebrate with Gail and the other artists and to chat with you. These are my pieces that are there and will be hung by now! I dropped some new pieces off at the Saskatchewan Craft Council Boutique and they are hanging already! It is exciting to see them amongst all this wonderful art and fine craft! 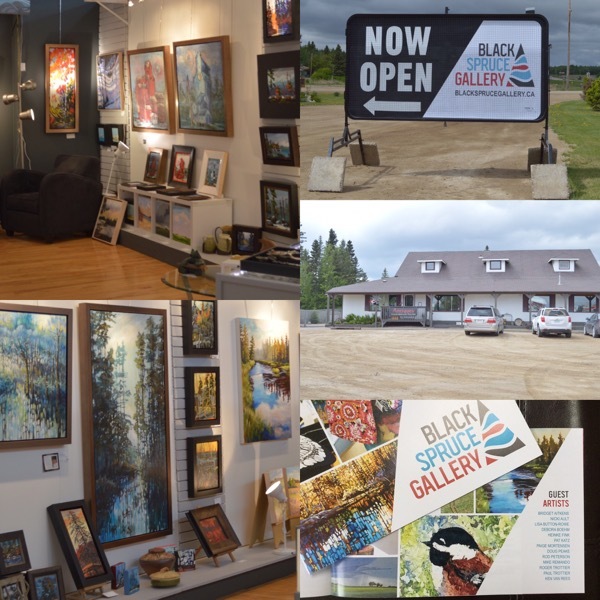 The Black Spruce Gallery is on winter hours right now but there is still lots to see! 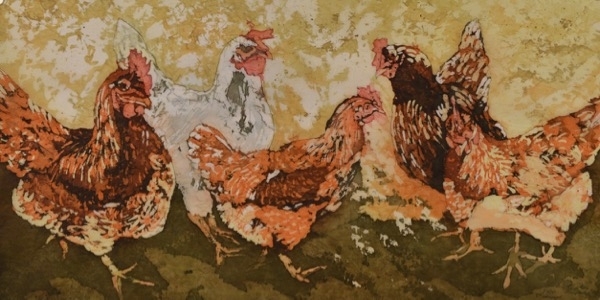 My watercolour batik birds and other pieces are on display! It is located in the NorthSide Antiques building on Highway #2 at Northside, SK. I suggest you call ahead to confirm the hours (306 982 4222). 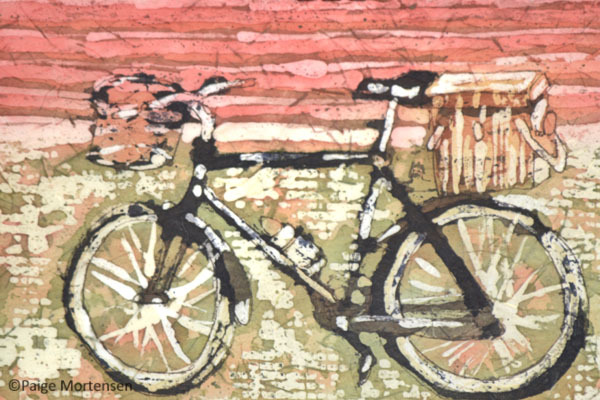 This entry was posted in Being an Artist, Events, Gallery, Out and About, Watercolour Batik and tagged Gallery, Show & Sale, Watercolour Batik on November 13, 2017 by Paige Mortensen. 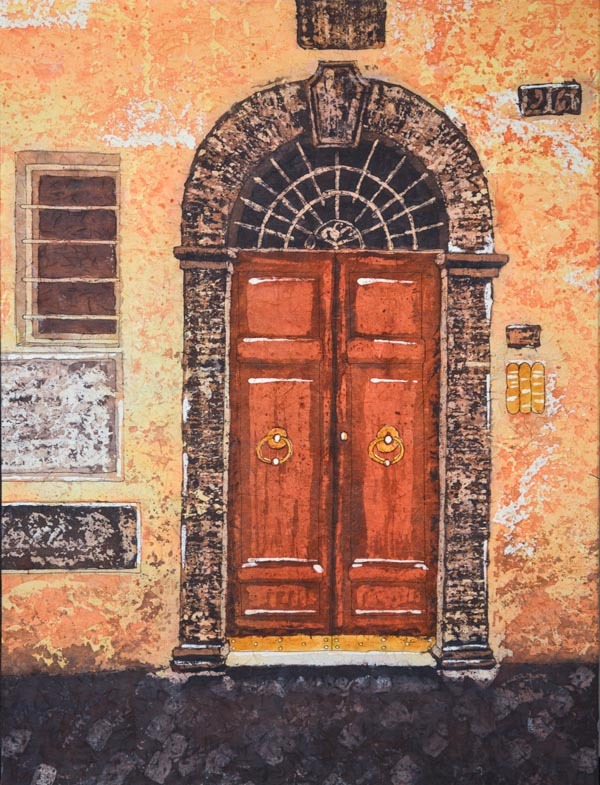 Portals opens at the Mann Art Gallery with Reception on Friday, May 26th at 7 p.m. I am excited to share that my show, Portals, opens this Friday, May 26th, 2017 at the Mann Art Gallery in Prince Albert with a reception at 7 p.m.! It would be great to see you there but if that doesn’t work for you the show is up until July 4th so hopefully you can stop in sometime before then. What were their lives like? I came home with a mass of reference material and this series began. The series was originally called Stories Inside because of all the questions I had about the stories of the people who built and lived behind these doors. Lately we seem to be doing a lot of driving and I have been paying more attention to some of our own prairie architecture. The grain elevators and barns could not have been easy to build without today’s equipment either. So my work has been moving closer to home. And I ask the same questions about my more recent ancestors. All of these are Portals. Doors and windows that remind us to be curious and hopefully connect us to different times and places. 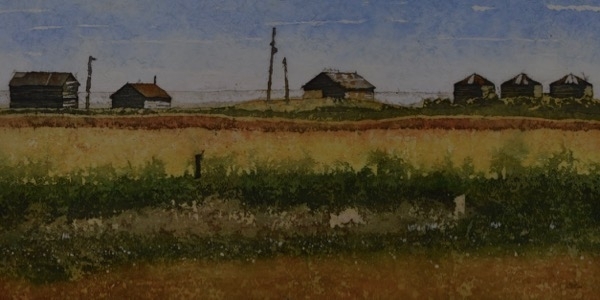 I’d also like to invite you to drive about 1/2 hour north of Prince Albert to Northside where you will find Black Spruce Gallery and more of my watercolour batiks. It shares a building with an antiques store so you are bound to find all sorts of interesting treasures. I was just there and the gallery looks fantastic! I hope you can include some art in your early summer plans! 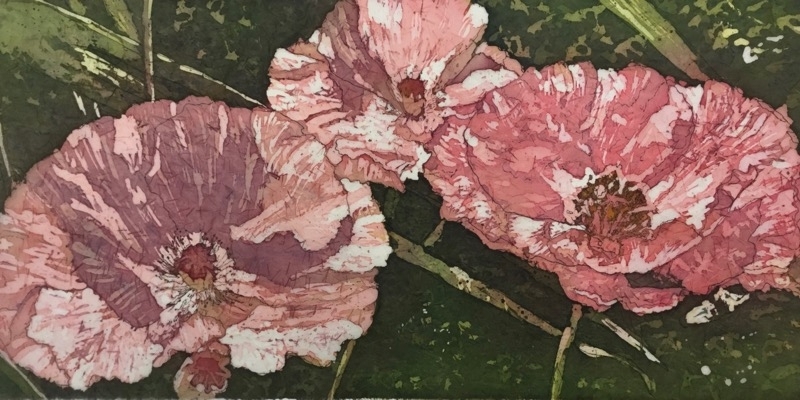 This entry was posted in Events, Gallery, Watercolour Batik and tagged events, Gallery exhibition, Watercolour Batik on May 23, 2017 by Paige Mortensen. 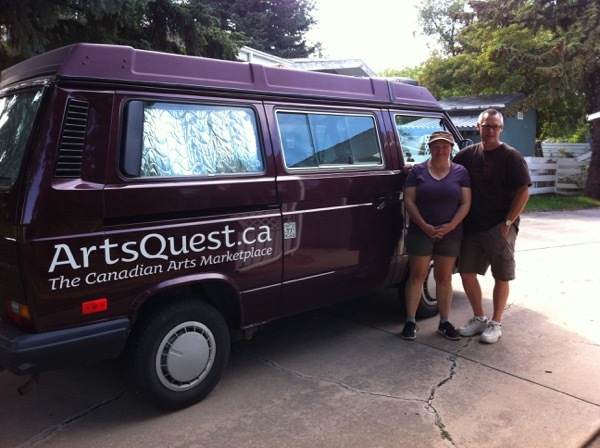 In August, Corinne and Gary of ArtsQuest came for a studio visit. As it says on their website they are “traveling Canada, building the premier online Canadian arts marketplace.” I am honoured that they chose to visit me. The were obviously curious about my watercolour batik process and interested in my life as an artist. I look forward to connecting with Corinne and Gary again soon. Here they are with their trusted van “Arty”. For now they are posting interviews of artists they meet on their travels. I am not fond of looking at video of me – or of listening to myself talk. Corinne & Gary did a great job putting this together though so I do hope you will have a look. 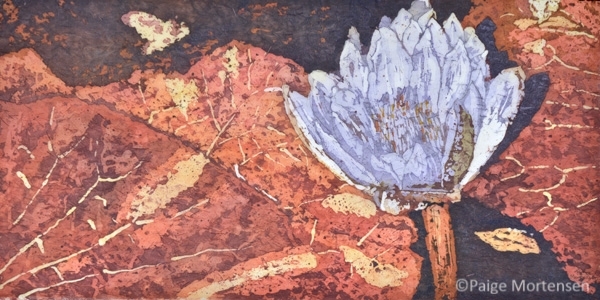 Here is a link to mine: http://artsquest.ca/2016/09/21/batik-watercolour-artist-paige-mortensen-irons-out-the-past/ While you are there check out some of the other interesting people they have met along the way! Look what I found in the paper! Elevator Stop is one of my pieces featured on the guest artist wall at Handmade House until the end of September 2016. 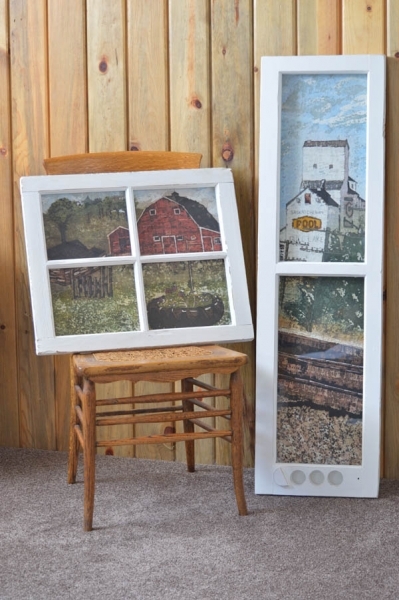 Handmade House can be found at 702 Broadway Avenue Saskatoon, SK. 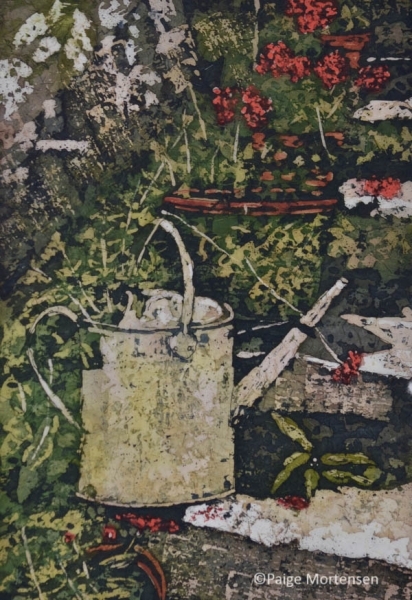 Humboldt & District Museum and Gallery is hosting a members’ show. 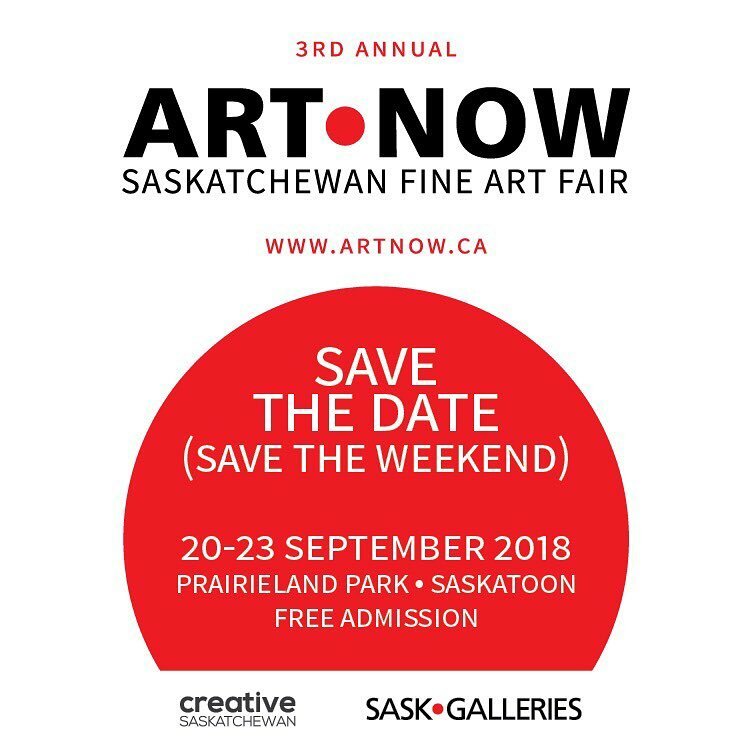 Several artists from Saskatoon, including myself are participating in it. I haven’t been yet but I from the pictures it looks like a great show! You can check it out until November 5, 2016. This entry was posted in Being an Artist, Gallery, Out and About and tagged events, Life, Publicity on September 24, 2016 by Paige Mortensen. When I first heard about the Station Arts Centre Postcard Fundraiser I thought “What a fun idea”! I was out to see the exhibition and they have over 180 postcards in their silent auction! The variety is fantastic and they look great on the walls! Show dates are June 21 – August 7, 2016. 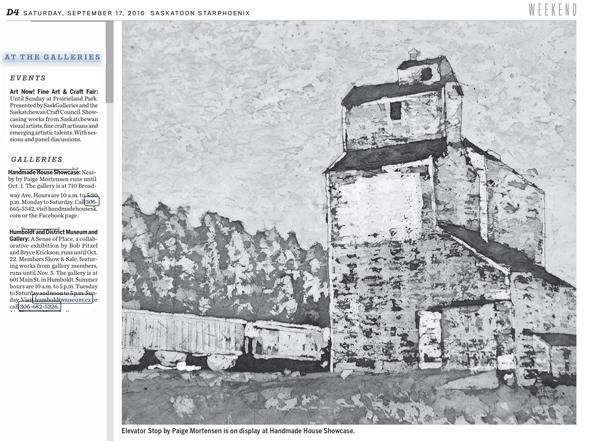 I wanted my submissions to reflect the town of Rosthern, the people who live there and Saskatchewan. The elevator is one of two still standing along the tracks through Rosthern and feels similar to elevators in many towns around the province. The last time I was out to the Station Arts Centre this bike was sitting outside the building. It has such a wonderful basket on the back! I don’t know the owner but it was fun for me to hear that she was excited to see her bike in the exhibition! And, for anyone who doesn’t know, the Prairie Lily is Saskatchewan’s flower. The entire Postcard Fundraiser collection is posted on the Station Arts Facebook page if you are interested in seeing more. Mine are #127, 142 and 144. In November 2015 I heard Leah talk about her exhibition (Country Wives & Daughters of the Country: Metis Women of this Land) at the Saskatchewan Craft Council Gallery here in Saskatoon. She is expressing an important message and I was fascinated with the works. I hope you can check out the exhibitions – as well as their summer theatre show – “The Moonlight Sonata of Beethoven’s Blatz”! 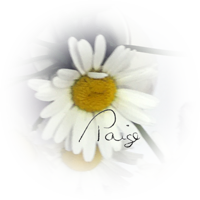 This entry was posted in Being an Artist, Gallery, Out and About and tagged Community, events, inspirations, Life on July 14, 2016 by Paige Mortensen. Summer is here and with it come thoughts of sun, sand, water, … and art! The northern Saskatchewan forest is a wonderful change from city life. I love sitting on the beach, reading, walking and enjoying the sounds of nature. My art making changes to simple sketches and experimentation just for fun and relaxation! Nature provides lots of inspiration – but so does a visit to an art gallery. As you head north to Christopher, Emma or Anglin Lake, Elk Ridge, Prince Albert National Park or La Ronge you will drive through Northside. There, a historic dance hall is now Northside Antiques & Collectibles…and Black Spruce Gallery. The gallery has been open since 2010 and every year it gets more impressive. We stopped on the weekend and WOW – it looks fantastic! They have an amazing range of work with something for everyone. In addition to paintings you will find pottery, sculpture, jewelry and more. 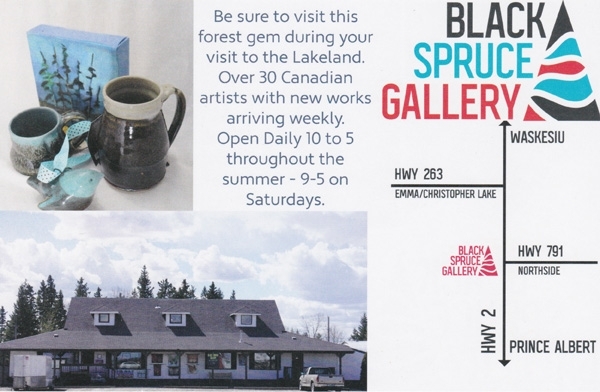 I am honoured to be represented by Black Spruce Gallery (since 2012). 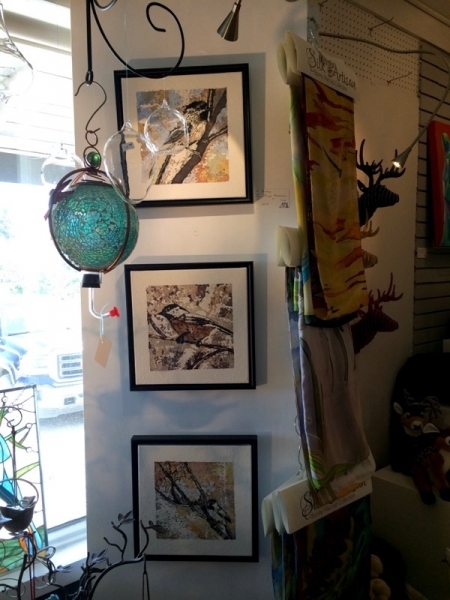 I delivered some new pieces and these three “Spring Break” birds were on display immediately! When you stop at the gallery you will also see “By the Sandbar” (top) – one of my favourite places to stop as we walk. Enjoy nature … and art! 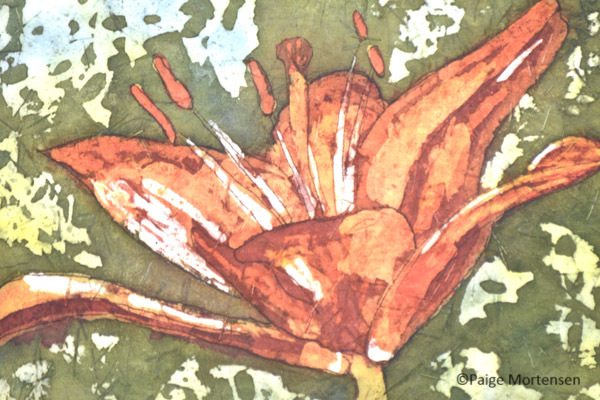 This entry was posted in Events, Gallery, Portfolio, Watercolour Batik and tagged Gallery, Watercolour Batik on May 25, 2016 by Paige Mortensen.